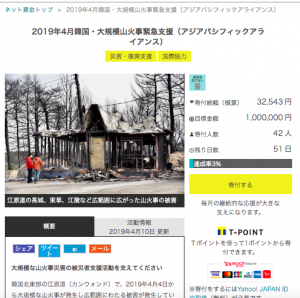 April 11, 2019 – The wildfires in Gangwon Province, South Korea have devastated the region. A-PAD opened a donation site through Yahoo! Japan Donation to support the emergency assistance carried out by A-PAD Korea. A-PAD Korea has been working on the ground to provide emergency relief items to the victims in need. Your assistance will be greatly appreciated.